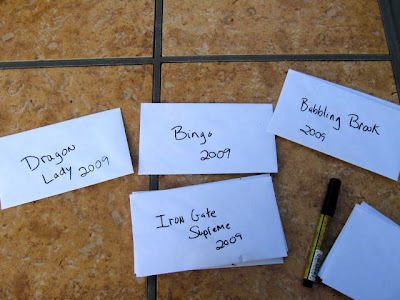 First I start by labeling some paper envelopes with the names of the hosta I am collecting seeds from and the year. I don't use plastic bags because the seeds still have some moisture in them, and if you put them in sealed plastic bags they will mold and rot. This is what hosta seed pods will look like when the seeds are ripe and ready for harvesting. This is how ripe hosta seeds look. If you shake the hosta seed pods, the seeds should fall out. Seeds gathered from my hosta 'Dragon Lady'. Hosta do not come true from seed, meaning if you plant a hosta seed it will more than likely not look like the parent plant. A green hosta will more than likely produce a green hosta. There is a 1 in 100 chance that a green hosta seed will produce a gold, variegated, or depending on what it was was pollenated with a blue hosta. Blue hosta seeds may result in blue, green, or gold hostas. Seeds from a streaked hosta may give you streaked hosta babies. hosta 'Ventricosa' is one of the only hosta that comes true from seed. Hosta seeds should be stored in a cool, dry place once they are gathered. I sometimes keep them in paper envelopes in my unheated garage or the refrigerator. You can start hosta seeds indoors. I usually do this around January. I start by putting them in damp paper towel placed in a ziploc bag. Label bag and put it in a warm, dark place (like on top of refrigerator). Once the seeds start to sprout I place them in small cells of sterile soil with a plant light. You can skip the ziploc bag part, but I like to do it so I know which seeds are fertile. You can also winter sow hosta. I wash out plastic water/soda bottles and cut them almost in half in the middle. I drill small holes in the bottom of the bottle. I then fill a portion of the bottom with sterile soil and place some hosta seeds in the soil. Lightly dampen the soil. Duct tape the bottle back together where you had cut it almost in half. Take the cap off the bottle (so rain and snow can get inside of bottle), and then place outside in a sunny location. I usually place the bottles outside in January/February/March. The bottle acts as a miniature green house, and as the weather starts to warm up the seeds should germinate. Would you like to try to start some hosta from seed? The first 5 people to email me (see view my complete profile) and send me a self-addressed stamped mailer will receive hosta seeds from my garden. Cool. I thought about starting hosta from seed this year, but I decided I don't have the patience for this. Thanks for the post. It is good to keep the seeds in small cardboard boxes, or what would be the best way to keep them well?